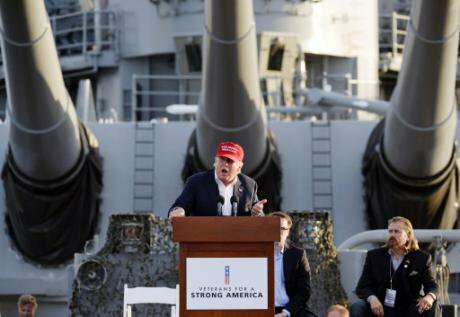 Donald Trump speaks during a campaign event aboard the retired ship USS Iowa in Los Angeles. Kevork Djansezian AP/Press Association Images. This election was the most polarised of any I have seen over the past 15 years or so since I became old enough to vote. I am an out gay man, have been in the military for 11 years, six of which were under Don’t Ask, Don’t Tell, and I think it’s important to note I do not believe Secretary Clinton or President-Elect Trump were the best two candidates for the office of president. However, in the United States we are left with the reality we have only two viable political parties from which to present candidates. This leaves the American public to decide, in some cases, between the lesser of two evils. This year, the candidate I agreed with more and disliked less was Donald Trump. One of the major issues of this election was the 2nd Amendment, 'the right of the people to keep and bear arms'. Americans love guns and, they are so ingrained in our national DNA, for a lot of Americans an attack on guns is an attack on us personally. I bought my first handgun when there was a rash of people threatening motorcyclists with knives and forcing them off their bikes in my town, and I decided I wasn't going to be one of those people. Now, I don't expect I'll ever have to use a weapon, but I'd rather have it and not have to use it than the other way round. My inherent right to self-defence is far more important to me personally than a fear of tyranny or a desire to prepare for my government to turn on me, which I know matter to some other people. I might have agreed my position was not the intended purpose of the 2nd Amendment until District of Columbia v. Heller (554 U.S. 570 (2008)) and McDonald v. City of Chicago (561 U.S. 742 (2010)). Many Americans think that our right to self-defence was in the 2nd Amendment right from the start, but actually the Supreme Court changed the meaning and power of the 2nd Amendment with these two cases in 2008 and 2010, and now the anti-gun fight is much harder to justify. Since 2010, my desire to protect my family and my person from criminals is constitutionally protected. We require training and a license to drive a car, why not implement similar controls on firearms? David Weigel with the Washington Post reported on June 13th of this year that Hillary Clinton calling for a new ban on assault weapons. An assault weapons ban makes no sense to me because there is very little difference between the capabilities of semi-automatic rifles, whether they look like assault weapons or like more traditional rifles. The only reason people like Secretary Clinton calling for these bans is because they make uneducated people feel a false sense of security. Anyone familiar with firearms knows there is no difference in these weapons other than aesthetics and no one to my knowledge on either side of the aisle has called for a ban of all semi-automatic hunting rifles. Furthermore, the firearms responsible for most mass shootings and most firearms related homicides in the United States are handguns, yet no one is calling for a handgun ban. (In fact, that’s a conversation I’d be willing to have.) But right now, the anti-gunner arguments simply don’t hold up to simple statistical analysis and amount to little more than fear mongering from and to people who are simply uneducated on the topic. I firmly support President-Elect Trump’s plan to overhaul the concealed carry permit system and establish training standards for safe firearm handling and storage, safe shooting techniques, background checks, and mental health screening. These are reasonable measures we can take to increase safety without neutering the 2nd Amendment through weapons bans and knee-jerk reactions to tragedies. We require training and a license to drive a car, why not implement similar controls on firearms? The bottom line on firearms in the United States is when laws are passed to disarm the public, little is done to disarm criminals, and the people are more vulnerable with fewer means to protect themselves. The second major issue that swayed me towards Donald Trump was the economy. We have seen so much of our manufacturing outsourced and sent to other countries and it’s really sad. We don’t make things in this country anymore. The Ford Motor Company’s new crown jewel, the Ford GT, is produced in Canada and will have to be sent back to Canada for higher-level services. Almost every other ‘American’ car is produced or assembled, at least in part, in Canada or Mexico. As factories leave the United States, those workers are forced to find jobs elsewhere and in many cases they aren’t able to do so. I went to high school in a town in South Carolina that has one factory in it. If that plant closes, what will practically everyone in that town do? Our economy has become very dependent on other countries and I don’t believe this is a good thing. Sure, trade is good, but you have to have something to trade! We also have to include the tax plans of each candidate in the discussion on the economy, because of the impact on quality of life and expendable income they have on people. Both candidates put forward plans in line with their respective party ideology, but Trump placed a larger emphasis on revitalising the middle class. This message reverberated with me and with a lot of other people across the country because the middle class has been left out for a long time. We always hear about new social programs for low-income families, and tax breaks for corporations, but no one has done anything in recent years to help the middle class. The middle class is screaming for help with their votes for Trump and the change he represents. One such change is revamping Obamacare. President-Elect Trump doesn’t want to repeal Obamacare as the mainstream media would have you believe. He wants to fix it and remove the burden from the middle class while still providing coverage to low-income families. Obamacare was great for low-income families with no other health insurance, but it was a total disaster for the middle class. Premiums skyrocketed and President Obama’s promises of being able to keep your current plan and your current doctor went unfulfilled, as many were forced out of their plans and doctors elected not to participate in Obamacare. The reality of this program is people like my sister lost her coverage and was forced to enrol in Obamacare only to find out her OB/GYN [maternity doctor] didn’t accept it. She was left driving over an hour while in labor just to get to a hospital with a doctor that accepted her Obamacare insurance. Secretary Clinton has stood behind Obamacare and stifled any discussion of changing it. This scares a lot of people because healthcare is vitally important to just about everyone and the current system is broken. Another major issue was immigration. This issue didn’t really sway me too much either way because I agree that immigrants should be allowed to come to the United States, but I also believe they should follow the rules when they do so. I am a third generation American; my family immigrated to the United States through Ellis Island about 100 years ago. I agree with Trump’s plan to strengthen border security. People who want to immigrate legally should be allowed to do so, but to have an open border where people can simply walk across without being vetted is ludicrous. As to deporting criminals, I haven’t seen a detailed plan from Trump, but based on how he has handled other things, like appointing Ben Carson who is a doctor himself to help fix Obamacare, I fully expect him to gather some experts and come up with a comprehensive plan to stop the current illegal immigration problem — while implementing a reasonable solution to deal with the undocumented immigrants who are already in the country. Deporting criminals makes sense, but deporting someone and breaking up a family over something minor like a simple marijuana possession charge seems a little extreme. For something like armed robbery it seems more appropriate, though this is why a detailed plan is needed instead of a blanket policy that deports everyone who is arrested. One major issue that surprisingly just didn’t resonate with me is LGBT rights. As a gay man this issue hits very close to home, however the Supreme Court has decided it and I simply don’t see any major changes happening. President-Elect Trump himself said as much in a 60-minute interview after the election. Throughout the election campaigns the media painted Trump in a negative light and tried everything they could to make him appear to be a hateful, bigoted man. I simply don’t see it with respect to LGBT rights. At his rally in Greely, Colorado, Trump embraced the LGBT community in a way no Republican candidate has ever done. He held up a rainbow flag that said “LGBT for Trump” and paraded around the stage with it. Though the mainstream media and many gay rights groups want to ignore the gesture, no other Republican candidate in history has embraced the LGBT community in such a meaningful way. I believe Donald Trump believes gay marriage is a states’ rights issue, but he doesn’t appear to have any intentions of rolling back the advances made under the Obama administration. For this reason, LGBT rights were not a major factor in deciding my vote. I usually go to overseas media for my news – I read the Guardian a lot, and I get a lot of my news from Reddit. Trump made some seriously disparaging comments while on the campaign trail and to fail to address them would be unfair. His comments about immigrants being rapists, the Billy Bush tape, etc., are unacceptable. I attribute some of this to his inexperience in the political arena and not realising how important it is to make sure every word you utter is what you really mean. Some of the comments, namely the Billy Bush tape, I attribute to the media digging up as much dirt as they can to paint him in a negative light. This doesn’t excuse the comments, but during an election where mudslinging was the standard, it didn’t seem to be anything other than par for the course from the media. The one-sided mudslinging contest left me completely disinterested with anything the media “uncovered.” I used to love CNN but now I won’t turn it on. Actually I usually go to overseas media for my news – I read the Guardian a lot, and I get a lot of my news from Reddit. As a voter, I was left with determining what was worse, Donald Trump’s failure to think before he spoke, or Hillary Clinton’s apparent belief the rules don’t apply to her. To some, Trump’s comments may have been too much, but to me, Secretary Clinton made two grave mistakes, which I simply couldn’t get past. The first was the Benghazi scandal. Her refusal to provide support to Americans in danger abroad scared me. I have been on several overseas military assignments and the thought that if something happened to me next time no one would send help is terrifying. To then lie about it to the American people is inexcusable as a public servant. The second mistake Secretary Clinton made was the email server. Soldiers who mishandle classified material are sent to prison all the time. There is no element of intent to debate when it’s a soldier. I would expect a candidate for the position of commander-in-chief to be held to the same standard. Kristian Saucier took a few photos of a confidential part of a submarine and will now spend a year in prison. There was no evidence he transmitted the photos to anyone or had any ill intent. With Secretary Clinton, she sent thousands of highly classified, top secret, messages to an unsecured server, gave un-cleared persons access to the server, and then lied about it while ordering evidence to be destroyed. Clinton’s mistake was exponentially worse than Kristian Saucier’s and yet she was able to walk away unscathed while he rots in prison. First President Bill Clinton talking to the Attorney General days before the Attorney General defers to the FBI for charges, then the FBI reading 650,000 emails in nine days after it took a year and half to read the first 55,000 is mind-boggling. Secretary Clinton was clearly protected in a way no ‘normal’ citizen ever would be and I simply could not get past the corruption she stands for and the machine that supported her. I really don’t understand how we narrowed the field from roughly 330 million Americans to Secretary Hillary Clinton and Donald Trump. Surely we could do better. However, given these two options, I voted for change. I voted for the opportunity for change in Donald Trump. Our two-party system is flawed in that neither party has a realistic agenda. Both are somewhat extreme and only find balance through the peaceful transfer of power every four or eight years. I voted for President George Bush in 2004, President Obama in 2008 and 2012, and now President Trump in 2016. I am glad I wasn’t alone. I hope Trump follows through and does work to make America great again for all Americans, as he has pledged to do, and I look forward to the next opportunity for change in 2020!